When I baked some no knead bread today, I saved a piece of the dough for pizza. I worked some extra flour and oil into it so it wasn’t quite so wet as the original dough and rolled it out thinly. I like my pizza without a tomato base. 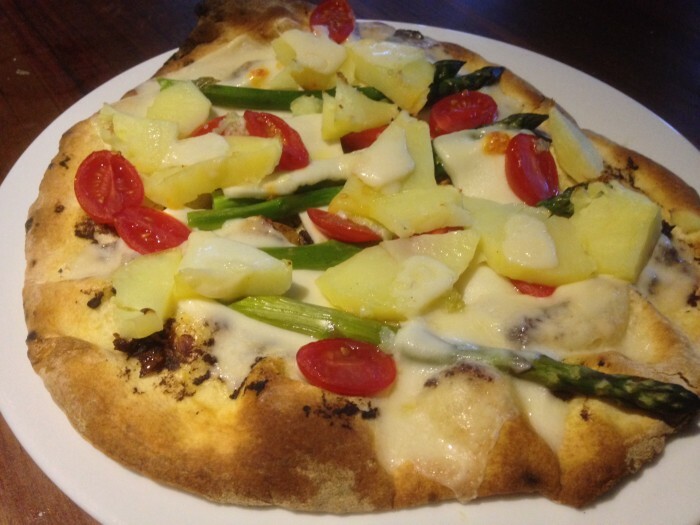 This one has olive tapenade, slices of cooked potato, steamed asparagus and sliced cherry tomatoes with Notzarella and olive oil with crushed garlic and a few drops of truffle oil. I pre-cooked the dough on a preheated tray in a hot oven at 230 deg C for 5 minutes and then took it out and quickly put the toppings on and put it back in the oven for another 10 minutes or so. The base ended up crispy and thin and not at all undercooked, which can happen if the toppings go straight onto raw dough. I swear it is as good as any artisan pre-vegan pizza I’ve ever eaten. Who needs cheese?